What are full mouth dental implants? How is full mouth dental implant process? What are the benefits of full mouth dental implants? Am I a candidate for full mouth dental implants? What is the cost for full mouth dental implants? 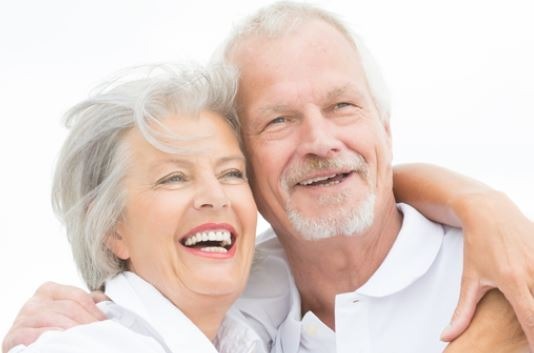 Full mouth dental implants in Orange County. Full mouth dental implants replace all of your teeth in each arch with crowns and bridges connected to implant posts. Full mouth dental implants is one option to replace all of your teeth in each arch. Getting full mouth implants is the ideal option for those who have no more teeth left in their mouth and want permanent, fixed teeth in place. It’s also a good tooth option for those who need to have all of their teeth removed due to advanced periodontal disease, widespread infection or other causes. 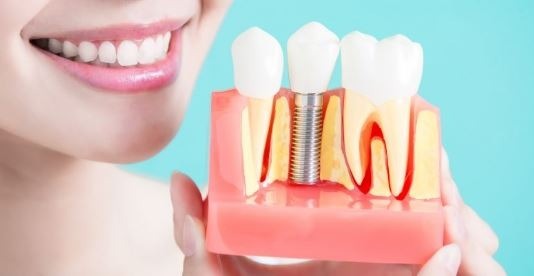 Essentially, full mouth dental implants replace all of your teeth in each arch with crowns and bridges connected to implant posts. They offer excellent aesthetics, full chewing capability and the feeling of having your own teeth back. In fact, having full mouth dental implants is the closest option to having your original, natural teeth back. What is full mouth dental implant process? A lateral wall sinus graft is used to buildup bone in the upper posterior region during full mouth dental implant treatment. The first step to full mouth dental implants is to make sure you have enough bone to support your dental implants. Unfortunately, most people with teeth missing for a long time don’t have enough bone left to support their implant posts. As such, most full mouth implant procedures require extensive bone grafting in preparation for implant placement. The most common grafting procedures used during a full mouth implant case are lateral wall sinus graft and block bone graft. 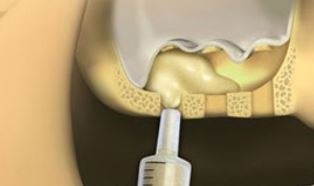 A lateral wall sinus graft is used to buildup bone in the upper posterior region while block bone graft is used to buildup bone in the lower posterior region. Typically, these grafting procedures require 3 to 9 months to heal and integrate before starting the next step. The average full mouth implant cases requires placing 6 to 12 dental implants per arch. Most full mouth implant cases require an average of 6 to 12 implant post per arch. Of these implant posts, about 4 to 6 will be placed in the anterior region and another 2 to 4 in each posterior region. Keep in mind, there will always be less posts placed than actual teeth which you will receive. Not to worry, these additional teeth will be added at the time of restoration and you will receive a full set of teeth at the end. Your final teeth will be a combination of individual crowns and bridges supported by implant posts. Finally, you are ready to receive some actual teeth! Your final teeth will be a combination of individual crowns and bridges supported by implant posts. 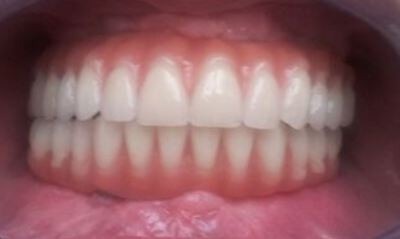 Your dentist will also make use of pink porcelain to add pink gum tissue in areas where there are significant gum loss. As you would imagine, treatment planning full mouth dental implant requires lots of preparation, experience and attention to details. Denture teeth are constantly flopping and moving and wearing dentures restricts your diet on a daily basis. Full mouth dental implants give you teeth which are fixed in their place. This means that your teeth will be stable and function like natural teeth do. 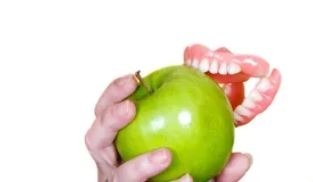 Implant teeth don’t move or rock the way denture teeth do so you can eat anything with them. Denture teeth are constantly flopping and moving and wearing dentures restricts your diet on a daily basis. porcelain and zirconia crowns are durable, sturdy and don’t change color over time. Implant crowns are made from high-quality, natural looking porcelain or zirconia ceramic. These teeth resemble your original teeth and are nearly impossible tell apart. 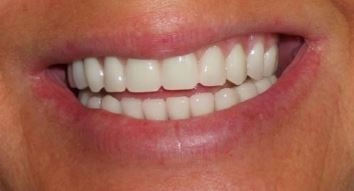 Additionally, porcelain and zirconia crowns are durable, sturdy and don’t change color over time. This means that your beautiful teeth continue to remain beautiful and perfect looking over the years. 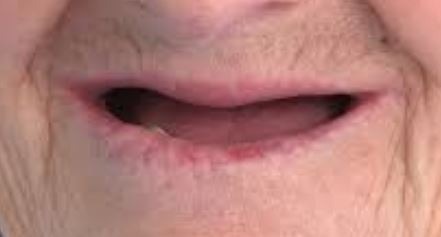 This is in huge contrast to denture teeth which are made from acrylic and break, discolor and wear out quickly. Full mouth dental implants offer you 90-100% chewing capability as compared to natural teeth. This means that you can eat pretty much whatever you want without thinking twice. On the opposite hand, denture teeth are not very efficient in cutting and crushing food particles. Most dentures wearers have only about 25-50% chewing efficiency as compared to natural teeth. This means that eating foods like steak, broccoli and carrots can be challenging for most denture wearers. Implant posts preserve your jaw bone structure whereas your crowns and bridges maintain your facial muscles. Placing dental implants in your mouth helps protect your jaws and facial muscles. The implant posts preserve your jaw bone structure whereas your crowns and bridges maintain your facial muscles. This is in contrast to denture wearers who experience the collapse of their jaw bone and facial muscles a few years after losing their teeth. Consequently, full mouth dental implants make you both look and feel much younger when compared to wearing denture teeth. If you have lost your teeth for a long time chances are you have to perform extensive bone augmentation procedures to prepare for full mouth implants. In order to receive full mouth implants you need to have enough bone to support the implant posts. If you have lost your teeth for along time, chances are you don’t have enough jaw bone for your implant posts. This means that you have to perform extensive bone augmentation procedures to prepare for full mouth implants. 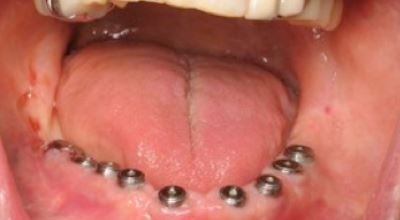 Typically, this involves sinus grafting of the upper arch and block bone grafting of the lower arch. The only option to bypass these surgeries and receive permanent teeth is to go for all-on-four implants instead. Since all-on-four implants use the anterior jaw bone, they bypass the need for these additional surgical augmentation procedures. To learn more about all-on-four treatment click here. The cost of most full mouth implant is typically about 10 to 12 times the price of a single dental implant. Be aware that full mouth dental implant treatment is the single most costly dental treatment option. This is because treatment typically involves extensive bone augmentation procedures, multiple implant post placement and extensive crown and bridge design. The cost of most full mouth implant is typically about 10 to 12 times the price of a single dental implant. This means that if your dentist is charging $2,500 per implant then a full mouth case will cost you between $25-30,000 per arch. While the price of full mouth dental implants may seem very high, it’s important to realize how much work you are receiving in exchange. This is the price of not having to wear dentures and struggle eating every day. Keep in mind, full mouth dental implant treatment takes a very long time and your dentist is likely to incur lab bills well into the thousands of dollars in the process. Obviously, financing is one option that many people choose to afford an expensive treatment like full mouth implants. However, if this is simply not in your budget, then you should consider all-on-four teeth as an alternative. All-on-four dental implants offer you permanent, fixed teeth but at a steep discount as compared to full mouth dental implants. Your only other options would be to wear dentures or overdentures. While these are far less expensive treatment options, both dentures and overdentures are also removable teeth instead of fixed ones. If you are interested in full mouth dental implants or all-on-four teeth in Orange County, give us a call today.